I get asked about container lifting solutions every day and which one is most suitable- to be honest it really depends on the application (Yes durrrr I know your lifting containers) but it does depend on how you wish to do it and what equipment and budget you have in mind. For sure you can lift containers using a crane but its about what is between the container and crane that really matters to avoid damage to the load or improper rigging technique. Containers should be carefully lifted without tilting or tipping the load, this helps when also laying them down on the deck of a ship. 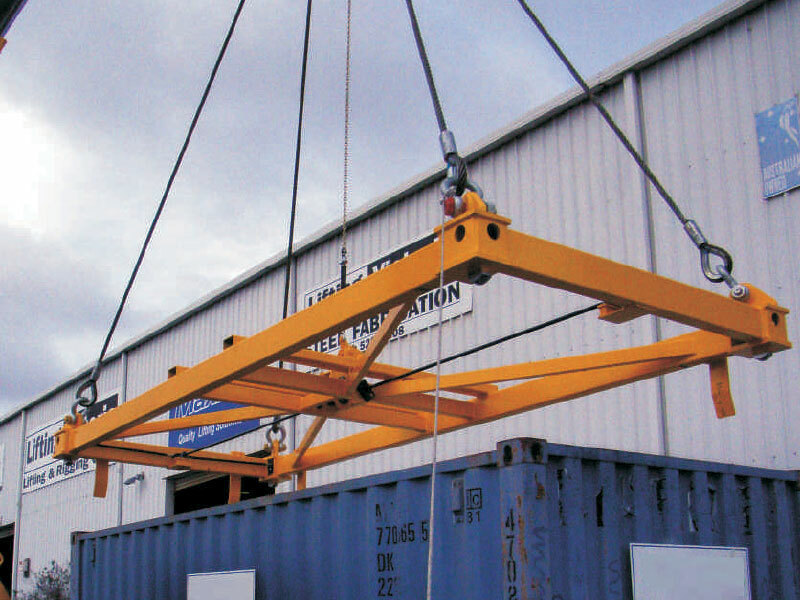 Full container lifting frames- these are frames that are the same size as the container if you were looking down on it, these usually feature container lugs on all 4 lifting points which connect with the container a lock in to place at the command from the operator (or even automatically on more advanced equipment). By far the most common solution and there is only really need for one lifting frame per crane/hoist. Mostly used in dockside transport where the sides of containers cannot be accessed once they are stacked on a boat, creating the need for a ‘picking’ technique. Container Lifting Lugs and Chain Slings- Very commonly used in small ports or in applications where the person rigging the crane can easily access the locking points for the lugs. There are two types of lugs, side lifting and top lifting- side lifting can only be used if there is clear access to the bottom sides of the containers where as top lifting lugs can be used in applications like loading and unloading from vessels alike the frame- lots cheaper however there is more work involved in attaching and removing the lugs before and after transport. Mobile container handlers which look similar to a large forklift with a long reach container frame are often the choice for large ports where containers have to be transported on land to areas where cranes cannot reach. These tractor like machines are very powerful and can lift up to 45000kg which covers most container loads. This entry was posted in Uncategorized and tagged container lifting solutions, dock, Export, Goods, handling, import, lifting, port, rigging, transport, vessel. Bookmark the permalink.